Alfred Nobel was a Swedish scientist who invented dynamite and willed his wealth to establish the prestigious Nobel Prize. He was born on October 21, 1833 to Immanuel and Karolina Andriette Nobel, the fourth of eight children. Only Alfred and three of his brothers survived childhood. He was the descendant of a famous Swedish inventor named Olof Rudbeck from the 17th century. Alfred’s father Immanuel was a handy inventor and engineer himself, and had belonged to the Royal Institute of Technology in Stockholm but he had been unlucky in business. The Nobel family moved to St. Petersburg, Russia when Alfred was very young, where Immanuel got a job manufacturing tools and explosives. This venture was a success and the family then hired a private tutor for young Alfred who soon became adept at chemistry. Apart from his native language, that was Swedish, Alfred also mastered several other languages including English, French, German and Russian. In 1850, Alfred moved to Paris to further his research and work in chemistry and at the age of 18, he moved to the United States. His first patent for a gas monitor was received in 1857. His family business of producing arms for the for the Crimean War was successful but after war ended, they had to file for bankruptcy. Alfred and his family then returned to Sweden but his two other brothers Robert and Ludvig remained in Russia where they brought the business back to its feet and became very wealthy. Alfred studied explosives and devised ways to make them safer for commercial use in construction. In September 1864, an explosion at their factory in Stockholm killed five people, one of whom was Alfred’s younger brother Emil. The government banned the use of nitroglycerine, a dangerous substance that was popularly in use. Alfred was more determined than ever to improve safety standards, which led him to invent dynamite, a much safer alternative to nitroglycerine. He experimented with different combinations of chemicals and produced a more stable substance that could easily be used for blasting rocks without being dangerous and causing loss of human lives. Alfred was a skilled and shrewd businessman and the growing demand for dynamite caused him to amass a huge fortune. His factory near Hamburg began exporting explosives to many countries in Europe, America and Australia. He kept expanding his business empire and established more nearly 90 factories and laboratories in more than 20 countries and held 355 patents to his name. Nobel lived in Paris but was constantly travelling which gained him the reputation of being “Europe’s richest vagabond”. Some of his other business ventures include the manufacture of synthetic rubber, leather and artificial silk. He was the founder of many prominent companies such as Imperial Chemical Industries (ICI) in Great Britain, Société Centrale de Dynamite in France and Dyno Industries in Norway. One of his close friends and associates was an Austrian woman named Countess Bertha Kinsky who briefly worked as his secretary. Bertha was a peace activist and the two kept in touch through letters over the remainder of their lives. 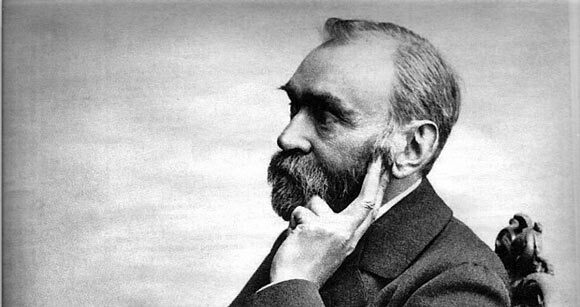 Alfred Nobel was a great linguist, poet and writer and died in Italy, on December 10, 1896. In his will, he left the majority of his fortune for the establishment of prizes to be given for outstanding accomplishments in the fields of Physics, Chemistry, Physiology or Medicine, Literature and Peace (this was done in honor of his friend Bertha Kinsky) regardless of nationality. His will was contested by his family but was finally put into action four years after his death. The value of the fund was 31,225,000 Swedish kronor and it is since universally regarded as the highest intellectual honor given worldwide.